What better keepsake gift than this unique poster? It's a gift that can bring back memories of a book loved and some happy times or create a memory of a special occasion. 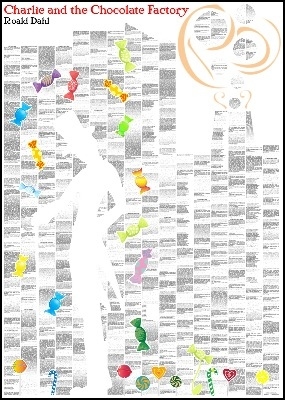 Full of imagination, this design shows the full text of Charlie and the Chocolate Factory on a single sheet as a bold art print. The enchanting tale of Charlie Bucket and his visit to Willie Wonka's amazing chocolate factory is the stuff of legend. From singing Oompa-Loompas to a river of molten chocolate, it's a dizzyingly inventive yarn which holds an unrivalled place in the hearts of anyone who is, or has been, a child who loves sweets. Presented for the first time all on one page, this is surely a golden ticket to the heart of any Roald Dahl fan. Comes in a strong cardboard tube for easy wrapping and giving.